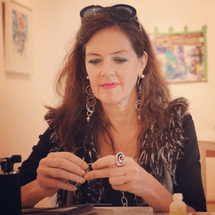 Lia Staehlin is a skilled goldsmith and a jewelry designer know for her iconic, fluid yet modern style creations. Having completed an intensive goldsmith scholarship under master goldsmith Gudrun Haefner and jewelers Schwer, Staehlin was awarded "Best Goldsmith in Schwaben". Staehlin continued her education and studied jewelry design at Fachhochschule Pforzheim School of Design. "Angels", the piece she created for her final diploma in "Spiritual Healing Jewellery for the 21st Century", won her the JNWS award in Tokyo, Japan. Staehlin was also commissioned by a princess in the UAE to create a customized jewelry set inspired by her favorite flower - the orchid. Her use of luminescent Ras Al Khaimah pearls and clear white diamonds won her an award at the International Jewellery Week Awards 2012, Dubai.